For some reason I haven't been moved to write about my current goings-on here. Recently I've been to the desert, experienced people's biases against grown ups who don't drive, got a jaywalking ticket (more on that later), and saw Werner Herzog defy all his moderator's attempts to guide his locution at a talk at UCLA. On Saturday I attended the all day Bike Summit at LA Trade Tech. It was a great chance to meet other bike activists and find out about all kinds of advocacy projects going on in LA. I totally think it's silly to talk about "networking" as a straightforward activity, but that's what it was. There were keynote speakers from New York's Transportation Alternatives, my friend Elly Blue from BikePortland.org, and two NGO professionals from DF, Mexico. Then there were three sessions of workshops and presentations. I went to City Lites' presentation about their Inner City Bike Tour that happens in May. I'll be volunteering there this year, and I think it's a great program to support bicycling in South LA. It's weird, though; they seem to take bicycling as a mode of transport for granted, when the rest of us are doing our best to legitimize the practice. I guess that's a good thing? Then Bobby and I gave our presentation on our efforts to get a ciclovía going in LA. Well, really Bobby gave the presentation he'd made, and I chimed in along with other ciclovía committee members when there were questions. Next I attended Elly's presentation on bicycling with families, which is a hot topic in Portland but seems more out of reach here in LA. Good discussion. I was pretty exhausted all day because of the LA bike culture and activism ride the night before that took us all over central LA with many stops to explain points of interest. Not much sleep. Still, I connected with some different people on my two main bicycling projects, the ciclovía and the City of Lights bike light distribution program. 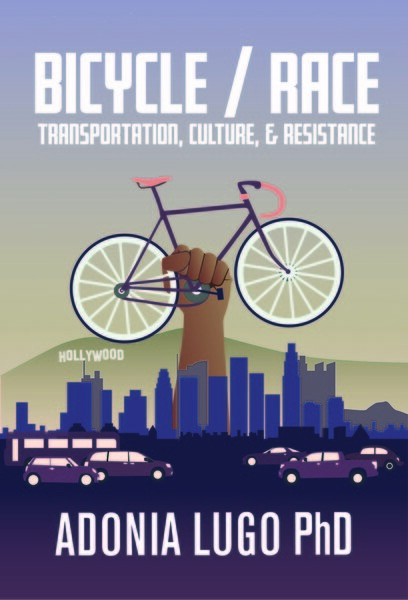 This latter one gets me majorly excited because it addresses the lack of inclusion in bike activism in LA: who represents the interests of Latino immigrant cyclists? The Midnight Ridazz stuff is wonderful, but does it include those who don't speak English or fixie? So on Monday Bobby instigated going and doing some light distribution at our local Metro stop, Vermont Beverly, and we gave out lights to six bicyclists. All men. I have to brush up my technique, but as usual my Spanish was much more functional than I expected it to be. It was a chilly, breezy afternoon.